This summer I treated myself to a volume of The Best of The Tough of The Track comic strips that once appeared in the British magazine for boys called Victor. For those unfamiliar with Victor it was a weekly comic paper published weekly from the 1960’s through to 1992. Victor ran a number of different comic strips I’d describe as boys own adventures, ranging from war to sport, and all intended to inspire and reinforce values including the competitive spirit into British lads, as well as those residing in the far flung colonial outposts. 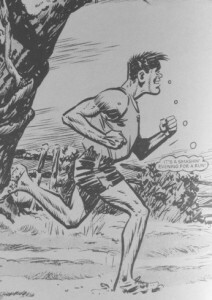 The Tough of The Track is a comic strip following the exploits and races of master-class miler Alf Tupper, and depending on the era he is drawn in, as either a great miler, world record holder or Olympic Champion. Alf Tupper first appeared in a predecessor comic magazine called Rover in 1949, and after the demise of Victor in 1992, The Tough of the Track comic strip appeared in other publications from time to time. Alf was from Greystone, a fictitious town in the working class north of England where he lived with his Aunt Meg until a falling out with her. Throughout the stories, Alf works as a self-employed welder. The Tough of the Track stories ran to a plot where Alf has to overcome one or more altercations to get to his race on time, then wins it against the odds, whereupon he declares he’s ‘run ‘em all.’ The stories usually wrapped with Alf rewarding himself with a bag of fish and chips. 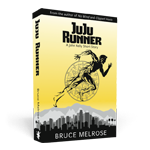 These were great stories of the classic underdog getting up to win against the establishment, and in that regard were inspirational for runners throughout the old Empire, including the likes of Olympic medallist Brendan Foster, who wrote the introduction for Victor’s The Best of Alf Tupper The Tough of the Track book, and me. I particularly love that there was always plenty of running action on the track. It is an aspect that resonated and got me excited about running. Somewhere in my subliminal consciousness, I found The Tough of the Track an inspiration for wanting to write my own stories about a mile champion, and particularly in having a healthy dollop of action playing out on the track included in my stories. If we fast forward today – 50 years on, there’s no greasy fish and chip dinners in sight for Alf or his competition. They’re an altogether different proposition. Alf’s equivalent today in the UK is Charlie Grice, who comes equipped with a head coach for running, a support coach, strength and conditioning coach, nutritionists, physiotherapist and a management agency for PR, marketing and sponsorship. The same is also true for Grice’s competition. When I was competing, back in my era, the great Peter Elliot (’88 Olympic silver medallist and ’90 Commonwealth Champion) was the closest to a real life version of Alf Tupper as there was, and probably among the last athletes competing on the IAAF Grand Prix, as it was back then, who held down a full time job. You’d be hard pushed to find someone like Elliot competing on the Diamond League today without a fully professional support team behind them, including a nutritionist vetoing that plate of fish and chips. As I understand it, Alf, having run his last race back in 1992 when he won the 1500m at the Barcelona Olympic Games… (hang on a minute!) has made comebacks from retirement, reincarnated by Athletics Weekly for another generation of runners to enjoy. I haven’t read any of the latest stories, but I believe that in one story Alf was set to go head to head with Mo Farah in the London Marathon. Not to be outdone by Farah’s vast range from being Britain’s 1500m record holder to a 2-hr 05-min marathoner. And while that’s all well and good, in my head at least, we need to figure out who won the 1992 Barcelona Olympic 1500m final – (with apologises to the real gold medallist Fermín Cacho of Spain). If left to me, my bias is to back Kelly against Alf. It would make for a great short story. What a shame copyright gets in the way of these sorts of things! I can see it now, a three race showdown between Kelly and Alf at the Monaco, Zürich and Brussels DL’s coming down to the wire, with both Alf and Kelly breaking and trading the world record along the way. It’s a nice summertime dalliance and whoever you back to win between Kelly and Alf, The Tough of the Track remains an enduring series that continues to inspire many, myself included. I can only hope my own efforts also inspire in the same way over time. There’s much comfort to take from knowing there remains a solid fan base who still enjoy stories about a guy running laps of a track.